Garage doors are considered one of the most important and the heaviest part of your home. Thus, they must be properly maintained to ensure safe and smooth functionality. If you do not properly maintain and inspect your door on a regular basis, this can lead to a breakdown or a malfunctioning garage door. 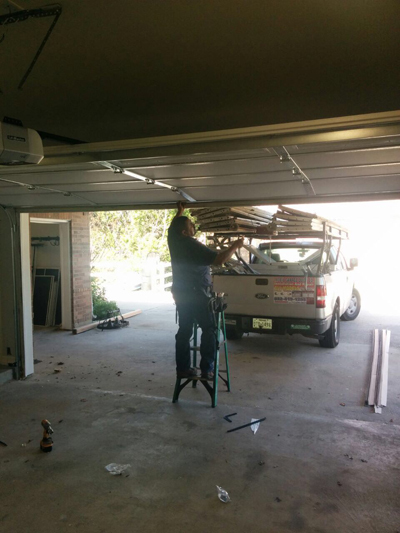 Why your garage door fails to work? There are common problems that can cause your garage door to malfunction. One of these problems is excess grease. This can occur at any time of the year. However, this becomes extremely problematic during the winter season. When you lubricate your door excessively, the rollers may misalign, which would then make it difficult for the door to close and open smoothly. You should find the right balance between enough and too much lubrication to ensure proper door maintenance. Another common cause of door failure is contracting metals. There are certain types of metals that contract when temperatures rise and fall below the desired rate. Your garage door has metal components like screws and springs. In such cases, these parts of the door have a tendency to shrink or contract. While this event may not be avoidable, you can minimize its effects if you add enough lubrication on these parts of the door. When the garage door is stuck at an open or close position, there are several reasons why this happens. If the door works with a remote, you need to check the batteries as well as the sensors. On the other hand, this may also be caused by an obstruction in the tracks. A garage door that opens unevenly is an indicator that there is an obstruction somewhere. You will need to clean the tracks and make sure that nothing is blocking the path. If this does not correct the issue, you need to check the spring and make sure that they have the same length and stretch quality. If your door is making a loud noise when opening and closing, the problem may be because of lubrication or obstruction in the tracks. Broken cables can also cause the door to malfunction. In fact, this can lead to serious injuries if not corrected right away.